If you are in an industry that touches data and engineering (who doesn’t these days? ), there’s no doubt you’ve heard about O’Reilly events and specifically Strata Data Conference (@strataconf). 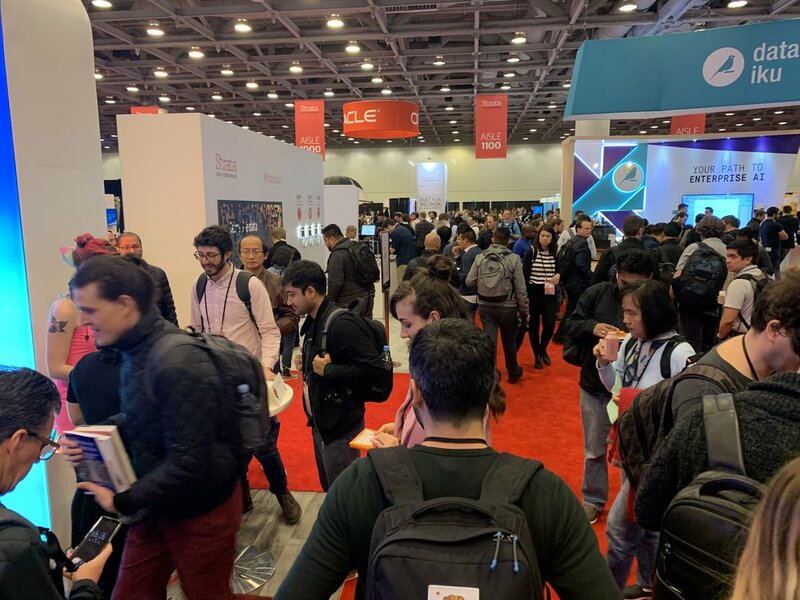 If you didn’t have a chance to attend this year, we’re giving you an inside look at what went down this week when the cred team attended Strata Data at Moscone Center in San Francisco. Only the best and the brightest in the data space, including amazing fierce women leaders. Amy O’Connor (@ImAmyO) kicked off the main stage content on Wednesday with her keynote on “The journey to the data-driven enterprise from the edge to AI.” As Chief Data and Information Officer at Cloudera, she talked about how the company “drinks its own champagne” by running Cloudera on Cloudera and what they’ve learned on their journey from the edge to AI. 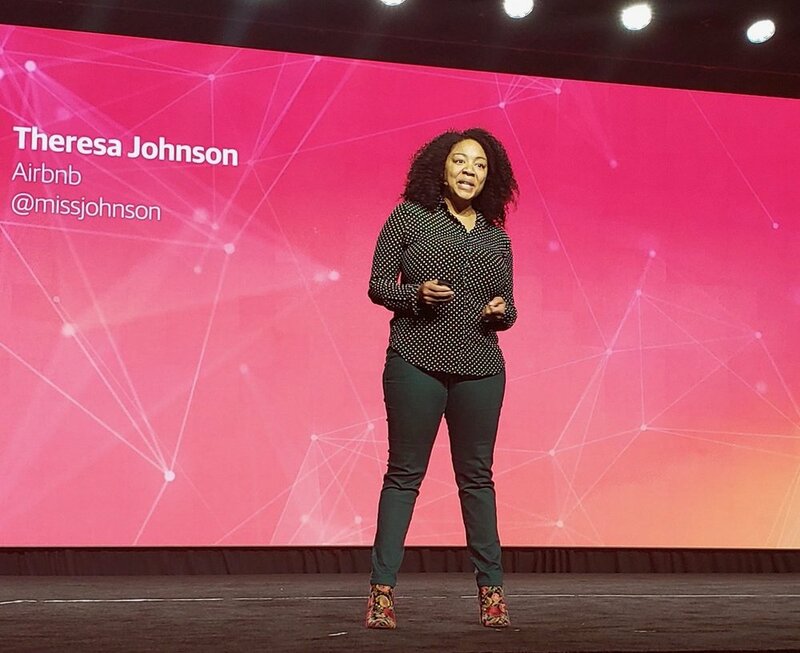 On Thursday, former data scientist and product manager at Airbnb Theresa Johnson (@missjohnson) talked about how she organized uncertainty at Airbnb and why black box models are not helpful. 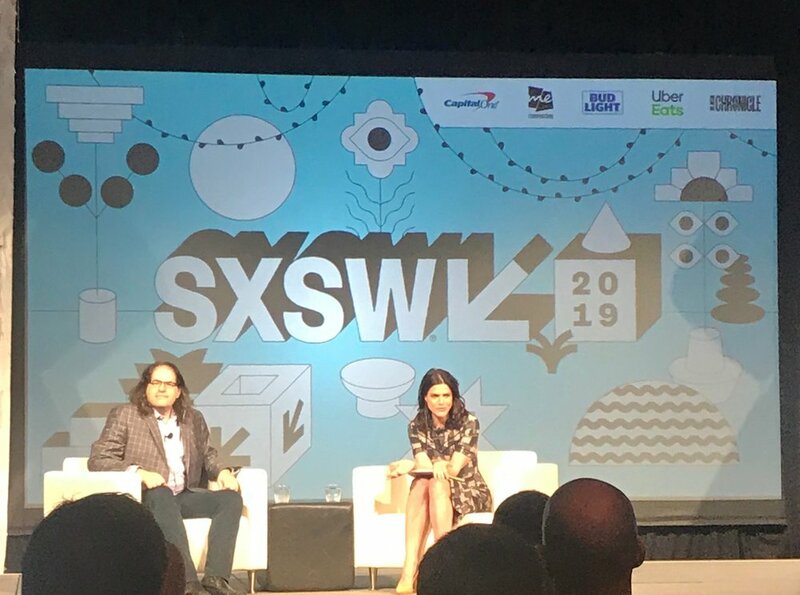 She talked about the internal tools they built to drive an end-to-end metrics forecasting platform, leveraging machine learning, Bayesian inference, TensorFlow, Hadoop, and web technology. Did it get technical? You bet it did! On Wednesday, Sonal Gupta, Research Scientist at Facebook, taught us about natural language understanding in task-oriented conversational AI. She outlined a way to do more advanced compositional understanding, which can understand cross-domain queries, using hierarchical representations. 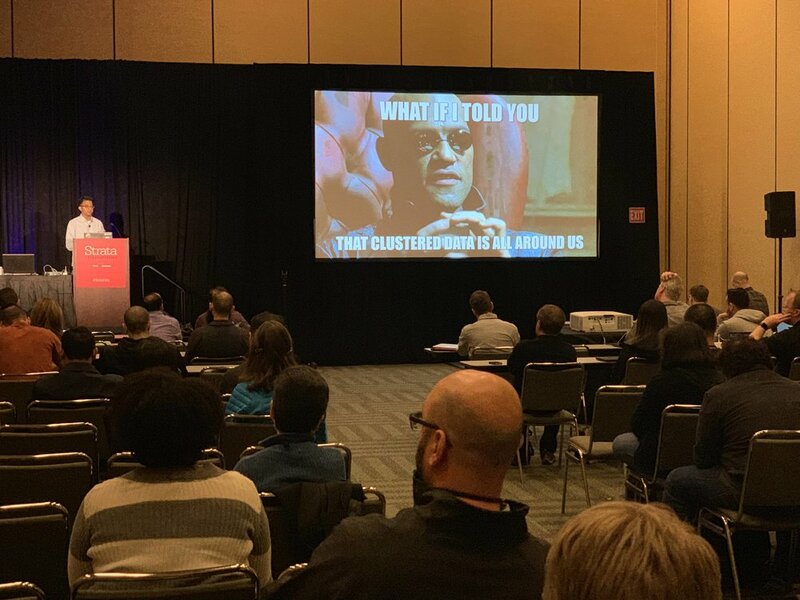 We love seeing our cred clients on stage, especially Manifold.ai CTO Sourav Dey (@resdntalien), who always brings his personality to very technical topics. He did two talks this week, I caught his second on Thursday where he talked about how to attack clustered data with Mixed Effects Randomized Forests (MERF). Who wants some swag? Let’s check out the Expo Floor. From professional headshots and massages to “techtris” and skee ball, the fun never stopped at the expo. We were excited to stop by the Okera booth and congratulate them for their win for Most Disruptive Startup. Their platform tackles the hardest issues behind data access and governance across distributed environments. Sippy cups are no longer just for babies—this one is for WINE! The team at Alteryx must have known cred was coming, this was winner of favorite swag grab of the day. We also learned a bit about the company, which offers an end-to-end self-service platform for data science and analytics. We also snagged some cool socks and stickers from Talend, a recognized leader in cloud data integration and data integrity. Last, but certainly not least, we chatted with our good friend Jonathan Symonds, CMO at Minio, about the company’s open source, enterprise-grade, Amazon S3 compatible object storage. Also got some pretty cool T-shirts to boot. Should you attend Strata Data? If you fall into one of the three categories below, we definitely recommend you check out the next Strata Data Conference or one of the other great upcoming O’Reilly events. Work in data & engineering? This is a great opportunity to learn the latest and greatest tools in the industry, network with your peers, and potentially snag that next great job. Company with a data science & engineering team? 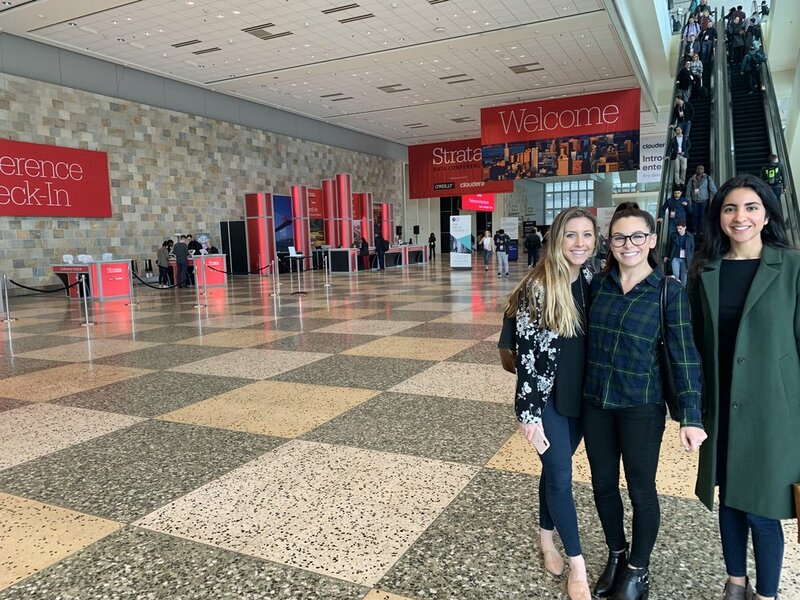 If you’re trying to recruit top talent in the data science & engineering space, Strata Data is the place to connect with prospective candidates. Company looking to better incorporate data into your business? Attend sessions to see the many cutting edge ways data is being applied within companies across industries and visit the expo floor to meet some amazing companies who may be able to help with your data game. Want to speak at an event like Strata Data? Get in touch and we’ll see if cred can help you get on stage. Also follow us on Twitter for more great event news and recaps. Get s#*t done. Hustle hard. Employees at startups are no strangers to these slogans in their fast-paced work environments. Leave it to startups to understand the unique hustle and grind necessary to build their small company into a booming success—breeding the next unicorn under the spotlight. An event fittingly named for this type of grind, Startup Grind Global, wrapped up its annual event last week and the cred team had the pleasure of attending. These days, on every corner in the Bay Area you can spot a software-as-a-service (SaaS) company—B2B organizations firing up products through the cloud that impact the way we work and engage with one another. Last week, more than 12,500 founders, entrepreneurs, senior executives, and VCs from the SaaS community gathered in downtown San Jose for the fifth iteration of SaaStr Annual 2019—the premiere SaaS conference in the Bay Area drawing in attendees from around the world. This was the first year the conference took place at the San Jose McEnery Convention Center and the outcome showed the event is growing more than ever. 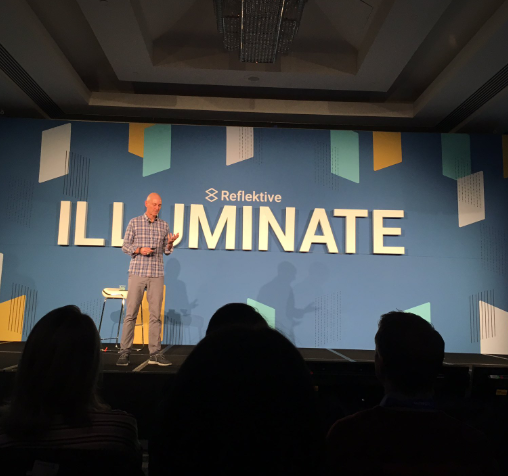 Last week, I attended Illuminate, a one-day people conference on a mission to make the manager-employee relationship better. Hosted by people management platform Reflektive, the event was filled with tactical takeaways to improve myself as a manager and contribute to the growth of cred’s culture and people. Featuring speakers from Allbirds, Airbnb, Omada Health, AppAnnie, Pinterest, and 23andMe, Illuminate shined light on the employee journey and its expansion to include a company’s work environment, mission, values, culture, and wellness. Omada Health CPO Jo Dennis and CEO Sean Duffy weighed the pros and cons of anonymous feedback before concluding their business is better off without it, opting for a transparent culture of feedback. Transparent feedback limits confusion, has ownership, and provides context. While not easy for anyone, giving constructive feedback does gets better with practice. In addition to sessions discussing diversity and inclusion and coaching culture at scale, Illuminate offered attendees a chance to win a pair of Allbirds following the event. While I didn’t win the Allbirds giveaway, I walked away with a deeper look into what it takes to be a better manager and overall a better team. Fairness is the foundation of feedback. Create an equal playing field by offering tools and resources that ensure everyone is speaking the same feedback language. Peer-to-peer feedback is just as important as manager-to-employee feedback. No one quits because they received too much praise from leadership. Top communication issues that prevent effective leadership include failure to recognize employee achievements, offer clear directions, and carve out time to meet with employees. People development and culture is a work in progress. It can be rewarding, challenging, messy and constantly has to be worked on. For more, here’s Reflektive’s official event recaps. Interested in continuing your learning and fostering a culture of #nobadmanagers? Check out these four books that stood out and were recommended by speakers and other attendees. I’ve added them to my reading queue, what about you? There’s nothing like sitting around a campfire sharing stories and creating conversation—but is it possible to recreate this warm and whimsical experience in a tech-obsessed city like San Francisco on a Tuesday night? TEDxSoMa thought so. 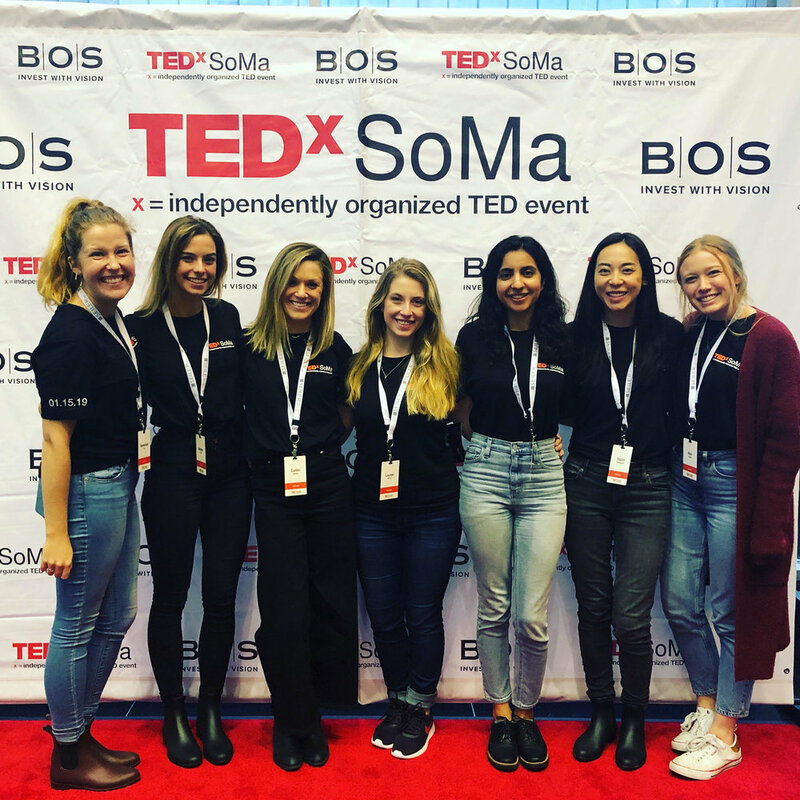 A handful of us from the cred team had the pleasure of volunteering at TEDxSoMa. We loved interacting with other San Franciscans passionate about attending a “modern campfire” to create community and connection. Juliana Delgado, an award-winning Colombian writer, spoke about the language hierarchy in the United States and how it limits a group’s access to opportunities and social acceptance. Mazin Jamal, founder and director of Holistic Underground, spoke about masculinity in today's culture and how to redefine what it means to "be a man." fnnch, an artist who believes art is for everyone, spoke about how street art is art for the masses. He shared the importance of looking for canvases everywhere, taking back public spaces, and investigating your town's local regulations around public art. Chief Sylvia Moir, a California native who serves as the Chief of Police in Tempe, Arizona, spoke about mindfulness. Dr. Yoni Alkan, a professional cuddler, sexual educator, and consultant, spoke about the power of platonic touch. Bishop William Swing, the former Bishop of San Francisco and current President and Founding Trustee of United Religions Initiative (URI), spoke about unity within community. The original and carefully crafted TED talks from these speakers did not fall on deaf ears. There was a full house and the audience was extremely excited to be there. One cred team volunteer even took a photo for a man in front of the stage who he said that being there was "a dream come true." While the speakers and topics were diverse, TEDxSoMa 2019 had the resounding theme of mindfulness as the common thread–the consistent theme about reframing how we think about our everyday lives. 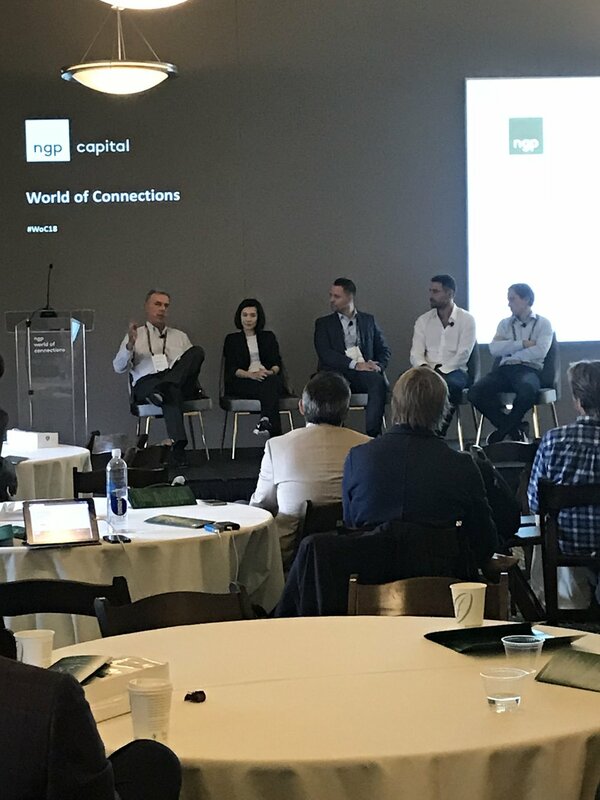 On November 14, Nokia Growth Partners hosted its fourth annual World of Connections event at the Golden Gate Club in San Francisco. 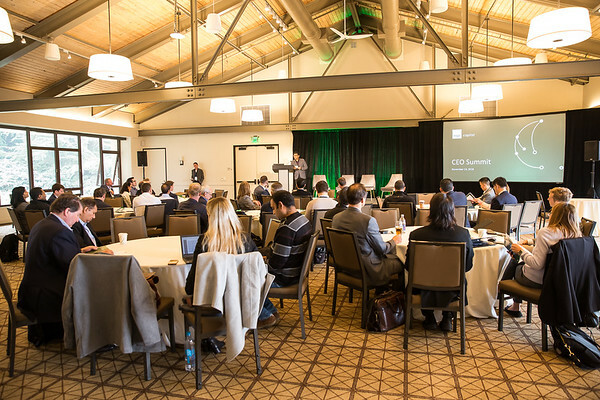 This year, 300 entrepreneurs, innovators, and technology leaders gathered to hear industry executives discuss this year’s theme of Digital Transformation. With a packed schedule consisting of three simultaneous tracks running throughout the day, attendees could listen in on sessions covering Intelligent Enterprise, Smart Mobility, and Digital Health. The day kicked off with an inspirational talk from Nokia CEO Rajeev Suri about the power of communication and value in addressing world problems. The schedule then split into the three key themes, each featuring varying formats of keynote speakers, panels, and fireside chats. Smart Mobility, one of the most popular tracks of the day, drew speakers from Ford, Uber Freight, Lime, and BMW i Ventures to touch on topics ranging from autonomous driving technology to the implications of smarter commutes creating smarter cities. Boasting another large crowd, Google Product Management Director Sampath Srivinas kicked off the cybersecurity session debating the increasingly prevalent topic of authentication. He was followed by a series of ‘innovator views’–emerging companies disrupting the space–who are tackling securing your workforce and addressing security threats. As the three successful tracks wrapped up for the day, attendees gathered one last time to hear from Oracle Executive Vice President Amit Zavery on the industries most likely to be transformed by software and the factors driving rapid adaptation. As the final keynote came to a close, everyone headed outside to conclude the day with a cocktail reception and networking. Check out some highlights from the conference below!